was born in Philadelphia and has a BFA in Pictorial Design from Carnegie Mellon University in Pittsburgh. A global traveler, his journeys began in the U.S. Army, which took him to Korea and Japan. Later travels took him to Europe. He lived in Amsterdam, Brussels, Rome and Prague, working in graphic design, art and illustration, audio visual production and design management. 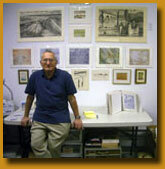 Ostroff has exhibited in Belgium, Holland, Italy, France, England, the Czech Republic, Canada and the U.S. His work is in collections in Europe, North America, Australia, New Zealand and Japan. In Philadelphia, his work has been shown at the Hahn Gallery, The Newman Galleries, the Philadelphia Museum of Art, as well as juried and invitational shows throughout the region. Projects have been commissioned by the Philadelphia Regional Port Authority, The Philadelphia Inquirer and others.